But this blog post says it's from Gujarat communal riots (1969). Does this photo depict the Sabra and Shatila massacre or Gujarat communal riots (1969)? The link on Wikipedia is dead but the description is enough to find information about the photograph: "1982, Robin Moyer, World Press Photo of the Year, World Press Photo of the Year"
A quick search with these terms led to the up to date page about this photo on worldpressphoto.org. 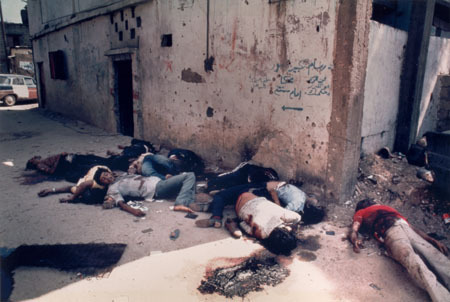 The photo also appears on Robin Moyer's website, with the label Sabra - Shatilla Beirut 1982 For Time Magazine. It seems an account is required to view the content of the article, but the cover is available to all, on the Time website. Not the answer you're looking for? Browse other questions tagged history war . Are Pathans the lost tribe of the Israel? Was Chinese water torture ever used as a torture method? Was Theodor Herzl a self-confessed atheist?